Name Variation Jane E. Kephard was also known as Kephart. Married Name Her married name was Ferguson. Jane E. Kephard married Thomas B. Ferguson. Jane E. Kephard was born circa 1846 at Pennsylvania. Name Variation John Galvin was also known as Galivan. John Galvin was born in March 1856 at Ireland. He was the son of Michael Galvin and Mary Odonnel. John Galvin married Rachel R. C. Wadding, daughter of William Wadding and Elizabeth (? ), circa 1881. John Galvin died after January 1925. 1 January 1925 Washington, Greene, Iowa He appeared on the census of 1 January 1925 at Washington, Greene, Iowa, living next door to Halsey Galivan. John Galvin immigrated in 1856. [S245] U.S. Federal Census 1900 U.S. Federal Census, by Ancestry.com, ED97. Dwelling 11. [S243] U.S. Federal Census 1920 U.S. Federal Census, by Ancestry.com, ED118. Dwelling 18. Name Variation Rachel R. C. Wadding was also known as Lena. Name Variation Rachel R. C. Wadding was also known as Dana. Name Variation Rachel R. C. Wadding was also known as Roxena. Name Variation Rachel R. C. Wadding was also known as Rachel S.
Married Name circa 1881 As of circa 1881,her married name was Galvin. Married Name circa 1881 As of circa 1881,her married name was Galivan. Rachel R. C. Wadding was born in January 1865 at Iowa. She was the daughter of William Wadding and Elizabeth (?). Rachel R. C. Wadding married John Galvin, son of Michael Galvin and Mary Odonnel, circa 1881. Rachel R. C. Wadding died after January 1925. 1 January 1925 Washington, Greene, Iowa Rachel R. C. Wadding appeared on the census of 1 January 1925 in the household of John Galvin at Washington, Greene, Iowa; living next door to Halsey Galivan. Rachel R. C. Wadding had 7 with 6 living in 1900 children. [S247] U.S. Federal Census 1870 U.S. Federal Census, by Ancestry.com, Year: 1870; Census Place: Greenfield, Warren, Iowa; roll: M593_423; Page: 324A; Image: 67; Family History Library Film: 545922. [S246] U.S. Federal Census 1880 U.S. Federal Census, by Ancestry.com, NA Film Number T9-0360 Page Number 581A. Joseph Rogers was born at Canada. He married Emma Chapin at Iowa. Joseph Rogers died before 1925. Emma Chapin married Joseph Rogers at Iowa. Emma Chapin was born circa 1856 at New York. Name Variation Jacob W. Kirfman was also known as Kirtman. Jacob W. Kirfman was born in March 1851 at Indiana also reported as Mar 1853. He was the son of George Kirfman and (?) Ronk. Jacob W. Kirfman married unknown (?) before 1877. Jacob W. Kirfman married Mary M. Sherman, daughter of Samuel Sherman and Martha Laird, circa 1882 at second marriage for both, Edwardville, Iowa. Jacob W. Kirfman died on 28 November 1931 at age 80. He was buried after 28 November 1931 at Woodland Cemetery, Polk, Iowa. 1920 Des Moines Ward 1, Polk, Iowa Jacob W. Kirfman was listed as the head of a family on the 1920 Census at Des Moines Ward 1, Polk, Iowa. 1 January 1925 Des Moines Ward 1, Polk, Iowa He appeared on the census of 1 January 1925 at Des Moines Ward 1, Polk, Iowa. Jacob W. Kirfman lived in 1880 at Scott, Madison, Iowa. He was a Name: Jacob W. Kirfman Location 2: 1216 w Mulberry Business Name: C. St. P. & K. C. R. R. Occupation: fireman in 1891 at Des Moines, Polk, Iowa. Name Variation Mary M. Sherman was also known as Molly. Married Name circa 1882 As of circa 1882,her married name was Kirtman. Married Name circa 1882 As of circa 1882,her married name was Kirfman. Mary M. Sherman was born in June 1853 at Pennsylvania. She was the daughter of Samuel Sherman and Martha Laird. Mary M. Sherman married Jacob W. Kirfman, son of George Kirfman and (?) Ronk, circa 1882 at second marriage for both, Edwardville, Iowa. Mary M. Sherman died after January 1925. 1920 Des Moines Ward 1, Polk, Iowa Mary M. Sherman was listed as wife in Jacob W. Kirfman's household on the 1920 Census at Des Moines Ward 1, Polk, Iowa. 1 January 1925 Des Moines Ward 1, Polk, Iowa Mary M. Sherman appeared on the census of 1 January 1925 in the household of Jacob W. Kirfman at Des Moines Ward 1, Polk, Iowa. Mary M. Sherman had 8 with 6 living in 1900 children. She had 8 with 5 living in 1910 children. Name Variation Leonard Frank DeLong was also known as De Long. Name Variation Leonard Frank DeLong was also known as Frank L.
Name Variation Leonard Frank DeLong was also known as L. F.
Leonard Frank DeLong was born on 17 October 1875 at Iowa. He was the son of Finton L. DeLong and Minnie J. Hartman. Leonard Frank DeLong witnessed the marriage of James Bolivar Macy and Mary Ann O'Connell on 13 August 1900 at Des Moines, Polk, Iowa. Leonard Frank DeLong married Fanny Clara Macy, daughter of Richard F. Macy and Isobel S. Davis, circa 1902. Leonard Frank DeLong died in 1942. He was buried on 3 July 1942 at Laurel Hill Cemetery, Des Moines, Polk, Iowa. [S244] U.S. Federal Census 1910 U.S. Federal Census, by Ancestry.com, Year: 1910; Census Place: Des Moines Ward 7, Polk, Iowa; Roll: T624_420; Page: 3B; Enumeration District: 0162; FHL microfilm: 1374433. [S250] U.S. Federal Census 1930 U.S. Federal Census, by Ancestry.com, Year: 1920; Census Place: Des Moines Ward 7, Polk, Iowa; Roll: T625_509; Page: 17A; Enumeration District: 166; Image: 866. [S250] U.S. Federal Census 1930 U.S. Federal Census, by Ancestry.com, Year: 1930; Census Place: Des Moines, Polk, Iowa; Roll: 677; Page: 18A; Enumeration District: 0084; Image: 308.0; FHL microfilm: 2340412. Name Variation Gladys Marie DeLong was also known as De Long. Married Name 17 June 1925 As of 17 June 1925,her married name was Astley. Gladys Marie DeLong was born in 1905 at Iowa. She was the daughter of Leonard Frank DeLong and Fanny Clara Macy. Gladys Marie DeLong married John Richard Astley on 17 June 1925 at Des Moines, Polk, Iowa. Gladys Marie DeLong was buried in December 1954 at Laurel Hill Cemetery, Des Moines, Polk, Iowa. She died in December 1954. Name Variation Leonard James DeLong was also known as Leonard F.
Leonard James DeLong married Myra O. (?). Leonard James DeLong was born on 15 March 1910 at Des Moines, Polk, Iowa. He was the son of Leonard Frank DeLong and Fanny Clara Macy. Leonard James DeLong was buried in 1962 at Laurel Hill Cemetery, Des Moines, Polk, Iowa. Finton L. DeLong was born at Ohio. He married Minnie J. Hartman. Minnie J. Hartman married Finton L. DeLong. Minnie J. Hartman was born at Indiana. Patrick O'Connell was born at Ireland. He married Nancy Gleason at Ireland. Married Name Her married name was O'Connell. Name Variation Nancy Gleason was also known as Clary listed in son's death certificate. Nancy Gleason married Patrick O'Connell at Ireland. Nancy Gleason was born at Ireland. Henry Betts married Mary A. Bussles. Mary A. Bussles married Henry Betts. Joel King married Addie Caroline Betts, daughter of Henry Betts and Mary A. Bussles, circa 1887. Leta B. King was born circa 1905. She was the daughter of Joel King and Addie Caroline Betts. James Johnson married Alice Gallager. Alice Gallager married James Johnson. Name Variation George Edward Croxen was also known as Edward. Name Variation George Edward Croxen was also known as G. E.
George Edward Croxen was born on 12 August 1883 at Atalissa, Iowa. He married Louisa Ogier, daughter of George D. Ogier and Emma A. Stauffer, on 2 July 1901. George Edward Croxen died on 10 April 1950 at age 66 George Edward Croxen obituary. 1925 Boone Ward 2, Boone, Iowa George Edward Croxen appeared on the census of 1925 at Boone Ward 2, Boone, Iowa. Name Variation Louisa Ogier was also known as Ogus. Name Variation Louisa Ogier was also known as Oger. Name Variation Louisa Ogier was also known as Deby Louise. Name Variation Louisa Ogier was also known as Ogre. Name Variation Louisa Ogier was also known as Louise. Married Name 2 July 1901 As of 2 July 1901,her married name was Croxen. Louisa Ogier was born in July 1884 at Iowa. She was the daughter of George D. Ogier and Emma A. Stauffer. Louisa Ogier married George Edward Croxen on 2 July 1901. Louisa Ogier died on 26 March 1950 at age 65. 1925 Boone Ward 2, Boone, Iowa Louisa Ogier appeared on the census of 1925 in the household of George Edward Croxen at Boone Ward 2, Boone, Iowa. Louisa Ogier had 1 with 1 living in 1910 children. Name Variation Raymond Joseph Jenaman was also known as Juneman. 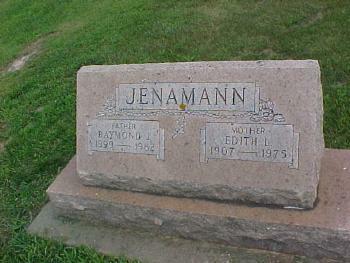 Name Variation Raymond Joseph Jenaman was also known as Jenamann. 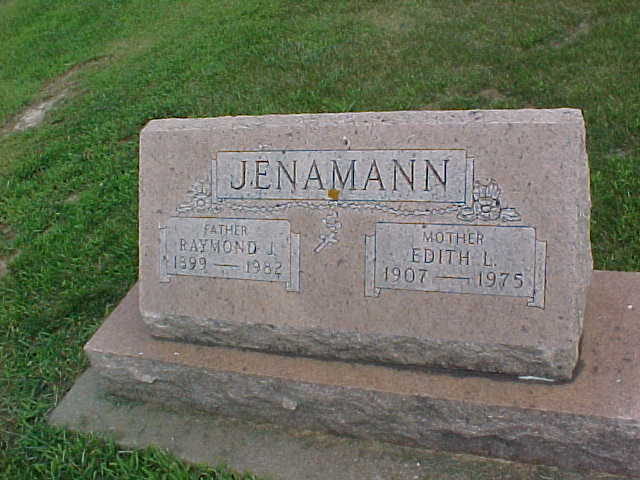 Name Variation Raymond Joseph Jenaman was also known as Jenemann. Name Variation Raymond Joseph Jenaman was also known as Jenneman. Raymond Joseph Jenaman was born on 8 December 1899 at Wisconsin. He was the son of Joseph Jenaman and Augusta Henrietta Caroline Reese. 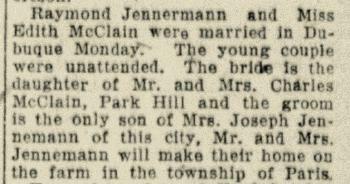 Raymond Joseph Jenaman married Edith Loretta McClain, daughter of Charles LeRoy McClain and Mary May Kreiser, on 3 March 1924 at Dubuque, Dubuque, Iowa, Raymond Jennemann (Jenaman) and Edith McClain wedding announcement. Raymond Joseph Jenaman was buried in October 1982 at Mt. Zion (Cornelia) Cemetery, Harrison, Grant, Wisconsin. He died in October 1982 at age 82. 1 January 1925 Dubuque, Dubuque, Iowa Raymond Joseph Jenaman appeared on the census of 1 January 1925 at Dubuque, Dubuque, Iowa. Raymond Joseph Jenaman obtained US Social Security Card at Iowa; last residence East Dubuque, Jo Daviess, Illinois. On 12 September 1918 at World War I Draft Registration, Grant, Wisconsin. [S245] U.S. Federal Census 1900 U.S. Federal Census, by Ancestry.com, ED47. Dwelling 105. Name Variation Joseph Jenaman was also known as Jenamann. Name Variation Joseph Jenaman was also known as Juneman. Joseph Jenaman was born in November 1871 at Wisconsin. He was the son of Joseph Jenaman and Anna (?). Joseph Jenaman married Augusta Henrietta Caroline Reese, daughter of Ludolph Reese and Johanna Fredricka Stender, on 31 January 1899. Joseph Jenaman died on 26 March 1924 at age 52. [S246] U.S. Federal Census 1880 U.S. Federal Census, by Ancestry.com, NA Film Number T9-1427 Page Number 284A. Married Name 31 January 1899 As of 31 January 1899,her married name was Juneman. Married Name 31 January 1899 As of 31 January 1899,her married name was Jennaman. Married Name 31 January 1899 As of 31 January 1899,her married name was Jenaman. Married Name 31 January 1899 As of 31 January 1899,her married name was Jenamann. Augusta Henrietta Caroline Reese was born on 15 April 1870 at Wisconsin also reported as Aug 1871. She was the daughter of Ludolph Reese and Johanna Fredricka Stender. Augusta Henrietta Caroline Reese married Joseph Jenaman, son of Joseph Jenaman and Anna (? ), on 31 January 1899. Augusta Henrietta Caroline Reese died on 16 September 1962 at age 92. Augusta Henrietta Caroline Reese had 2 with 2 living in 1910 children. Married Name 13 February 1890 As of 13 February 1890,her married name was Ames. Sarah Sophia Kreiser was born in August 1871 at Wisconsin also reported as 1872. She was the daughter of Christian Jacob Kreiser Sr. and Margaret Schambauch. Sarah Sophia Kreiser married William Jacob Ames, son of Jacob Ames and Mary Ward, on 13 February 1890. Sarah Sophia Kreiser married Jacob William Ames, son of Jacob Ames and Mary Ward, circa 1907 at Grant, Wisconsin, first marriage for him; second for her. Sarah Sophia Kreiser died in June 1949 at age 77. 1 June 1905 Potosi, Grant, Wisconsin Sarah Sophia Kreiser appeared on the census of 1 June 1905 at Potosi, Grant, Wisconsin. Sarah Sophia Kreiser had 6 with 4 living in 1900 children. She had 10 with 7 living in 1910 children. [S244] U.S. Federal Census 1910 U.S. Federal Census, by Ancestry.com, ED43. Dwelling 8. [S243] U.S. Federal Census 1920 U.S. Federal Census, by Ancestry.com, ED123. Dwelling 1. [S250] U.S. Federal Census 1930 U.S. Federal Census, by Ancestry.com, ED50. Dwelling 121. Name Variation Ricca P. Ames was also known as Ricka P.
Name Variation Ricca P. Ames was also known as Fredericka P.
Married Name Her married name was Gunsaulis. Ricca P. Ames was born on 29 October 1893 at Wisconsin. She was the daughter of William Jacob Ames and Sarah Sophia Kreiser. Ricca P. Ames died in January 1984 at age 90. 1 June 1905 Potosi, Grant, Wisconsin Ricca P. Ames is listed as daughter on the census of 1 June 1905 in the household of Sarah Sophia Kreiser at Potosi, Grant, Wisconsin. Ricca P. Ames obtained US Social Security Card at Wisconsin; last residence Dubuque, Dubuque, Iowa. Name Variation Mae M. Ames was also known as Mary E. M.
Mae M. Ames was born circa 1903 at Wisconsin. 1 June 1905 Potosi, Grant, Wisconsin Mae M. Ames is listed as daughter on the census of 1 June 1905 in the household of Sarah Sophia Kreiser at Potosi, Grant, Wisconsin. Marguerite L. Ames was born circa 1909 at Wisconsin. She was the daughter of Jacob William Ames and Sarah Sophia Kreiser. Name Variation Christian William Ames was also known as Chris A. Name Variation Christian William Ames was also known as Christofer. Christian William Ames was born in March 1891 at Wisconsin. He was the son of William Jacob Ames and Sarah Sophia Kreiser. As of 1930, Christian William Ames was never married. 1 June 1905 Potosi, Grant, Wisconsin Christian William Ames is listed as son on the census of 1 June 1905 in the household of Sarah Sophia Kreiser at Potosi, Grant, Wisconsin. [S250] U.S. Federal Census 1930 U.S. Federal Census, by Ancestry.com, ED50. Dwelling 87.